Savory Shallot and Olive Pastries, Thyme for Cooking easy, gourmet. 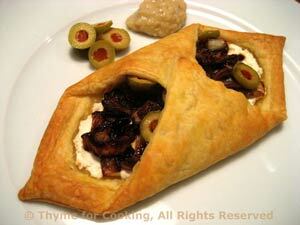 Spicy, sautéed shallots, salty olives and creamy ricotta fill these tender pastries. Heat oil, chili powder in medium nonstick skillet over medium heat. Add shallots and sauté until tender, about 7 minutes. Add Worcestershire and sauté 5 minutes longer, cooking off liquid. Lay out puff pastry and cut two 5 inch squares (12cm). Lay the cut pastry on a baking sheet. With a table knife, score a line around opposite corner edges of each pastry, about 1/3" (1cm) from the edge and halfway down the opposite sides. Divide the ricotta and spread down the middle, between the scored corners, covering the middle 'half' of the pastry. 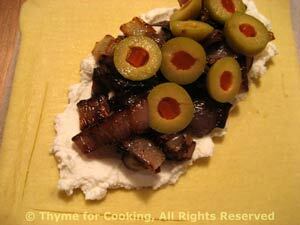 Divide the shallots and spoon onto the ricotta. Bring the un-scored corners together over the olives and press tips together firmly to seal. Bake in a pre-heated oven at 400F (200C) for 12 - 15 minutes, until golden brown. Remove and serve. Garnish with extra olives .